Class Listings Tables are not required to use online enrollment but they are highly recommended as they make a great experience for your customers. What exactly ARE Class Listings Tables anyway? They are a list of your available classes, and information about each one, displayed directly on your own webpages. The class information is updated automatically in REAL TIME so families view the current information. Classes are displayed in a table format (columns/rows). They are a dynamic "pull" of data straight out of your Jackrabbit database. They can be customized to show just the information about the classes that YOU want shown. They can be split apart into groups by Session, Location, and Categories. They are accessible via your webpages via PC, Mac, tablet or smartphone. They are mobile-friendly and will responsively transform when viewed on cell phones IF YOUR WEBSITE is optimized for mobile viewing. They can also allow enrollment directly from the tables for new or returning customers. 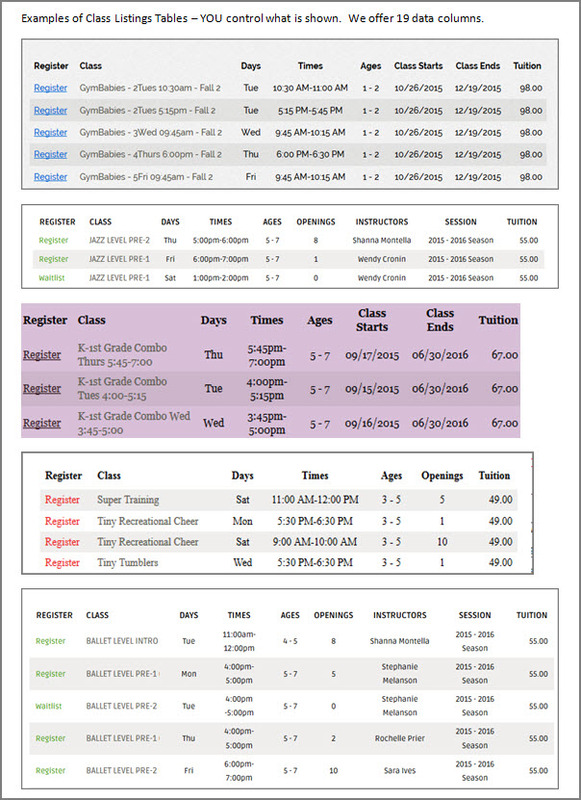 Class Listings Tables are the perfect way to showcase your available classes, schedules, and information in an organized, user-friendly manner. Your customers will LOVE the ease with which they can quickly find the perfect class. What do the tables LOOK like? You choose which classes are shown, which columns are shown, and also the sort order. You or your webmaster can also "jazz up" the appearance of the tables to your liking. To learn more about the options for customizing your tables visit our section of Help articles Customize Your Class Listings Tables with HTML Codes. To view over 30 full size and "live" examples, visit the Clients Websites page and follow the instructions for getting to the actual webpages. What are the website requirements and other important issues to know? WEB DEVELOPERS: Jackrabbit does not allow access via Cross-Origin Resource Sharing (CORS). You may use CSS to specify styles for the table for use with html tags such as DIV, SPAN, TABLE, TR, TD for the html codes as given in this guide. We also offer a class listing JSON API that will provide you with raw class data in json format which you can use to create a custom UI for your client - see the Integration Assistance article to contact our Integration Team and request a copy of the JSON document. Webmasters often ask us to increase the availability of cosmetic (non-functional) offerings and plugins. We have found that what is currently available is sufficient for most of our customer base. If you have "functional" (content-specific) enhancement ideas, please have your client submit the request to Jackrabbit through their database's SEND IDEA button.